In this program, we need to check whether the given matrix is an identity matrix. A matrix is said to be the identity matrix if it is the square matrix in which elements of principle diagonal are ones, and the rest of the elements are zeroes. Calculate the number of rows and columns present in the array and store it in variables rows and columns respectively. Check if given matrix has the same number of rows and columns(square matrix). If not, print the error message "Matrix should be a square matrix." 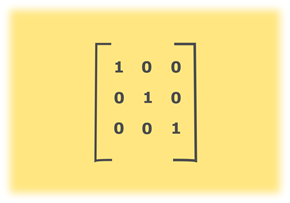 If given matrix is a square matrix then, loop through the array and check if all the elements of main diagonal are 1 and the rest of the elements are 0. If any of the condition is not satisfied, set the flag to false and break the loop. If the flag is equal to true which implies given matrix is an identity matrix. Else, given matrix is not an identity matrix.